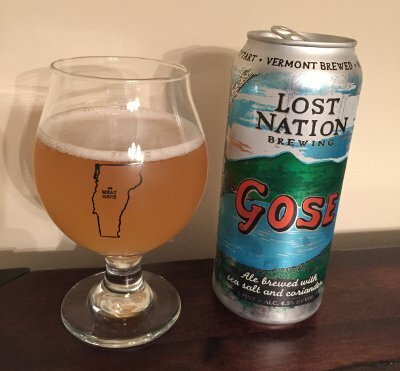 Can it be that I've never actually reviewed a Gose? Or is it that I was just too lazy to actually add the category and that's why I can't find it? It's pretty obviously the latter, but in my defense, they've only been in posts like beer clup recaps or epic Tired Hands roundups. All of which is to say that Gose is the new hotness and while I've had a few in my day, I've been woefully neglectful of this trendy style. So what's the big deal? Well, it seems like some old-timey German rebels gave the finger to Johnny Reinheitsgebot* and brewed a wheat beer with added salt and coriander, inoculated the abomination with lactobacillus (though I'm guessing this was more of a spontaneous fermentation than an addition, at least in the early days of brewing), and targeted the 4-5% ABV range. To my heretical American palate, it feels related to something like a Berliner Weisse or Grätzer, and it also seems like the style appeared out of nowhere in the past couple years. Indeed, it had been laboring under obscurity for several decades and has only recently seen a revival, both in Germany and elsewhere. Like, say, Vermont! Man, I regret not getting more cans of this (I split the 4 pick with two other people, and only got this one lonely can). Anywho, I've finally added the category to the blog, and I think you can expect to see a few more of these in the coming months... Indeed, I've even got another Lost Nation variant that I had a taste of before... look for a review soon enough! And maybe my next trip to Lost Nation will yield more yummy goodies. * Supposedly there was some sort of exception for "regional specialties" and it could also be that something about the water used for the beer gave it the salty character. Or something. Johnny Reinheitsgebot must not have been as bloodthirsty as previously assumed. This page contains a single entry by Mark published on June 22, 2015 11:15 PM. Switchback Citra-Pils is the next entry in this blog.